If you thought the alleged Brett Favre sexting scandal was the silliest soap opera subplot to Monday night's Jets-Vikings contest, then you are seriously underestimating the dramatic capabilities of one Randy Moss. The New England Patriots can't even have a bye week without an outlandish media report of palace intrigue in their locker room. CBS' "The NFL Today" pre-game show reported on Sunday that prior to the Randy Moss trade, Moss and Tom Brady were nearly engaged in a locker room brawl that included disparaging remarks about how the other guy wears his hair. 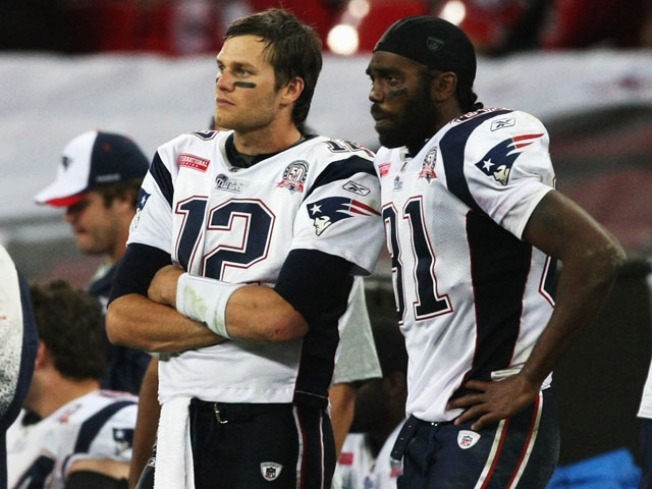 In a video segment available online, 24-year league executive and NFL Network personality Charley Casserly declared, "The week before Moss was traded, Tom Brady and Randy Moss went toe-to-toe and had to be separated when this happened." "One of Brady's problems with Moss was his behavior as a Patriot," Casserly continued. "Then, one of the things overheard was Brady telling Moss, 'You need to cut your beard.' Moss counters, 'You need to get your hair cut, you look like a girl.'" And here I always thought that locker room fights involved, you know, profanity and intimidation. NBC "Sunday Night Football" analyst Peter King digs into it and thinks it's baloney. "Two high-ranking Patriots sources told me the story isn't true," King writes at SI.com. "One of them said, 'Someone lied to CBS.'" The story remains unverified, and Patriots coach Bill Belichick was unsurprisingly dismissive of the reporting. "That's news to me," Belichick told ESPN Boston. But if it were true, then Brady's "You need to cut your beard" mentality would help explain why Logan Mankins is on the outs with the organization. Joe Kukura is a freelance writer who will root for Moss tonight for purely divisional motivations.